The Red Deer Senior Rustlers are back in the win column following a 3-2 win over the NCHL-leading Morinville Kings on Saturday, becoming the first team to do so in regulation this season. Coming off a narrow 4-3 loss to the Kings on November 24, the Rustlers came out of the gate with a three-goal first period, with two goals from Connor Patchett and another from Ty Berkholtz. Berkholtz added an assist on both Patchett goals to finish the game with three points, giving him the team lead with 14 points on the season. The Kings finally solved Rustlers netminder Brett Bothwell late in the second period, and would add another with a two-man advantage in the third, but the Rustlers shut the door the rest of the way to preserve the win. Special teams were the difference maker for the Rustlers, who went 2-for-5 on the powerplay, and an impressive 7-for-8 on the penalty kill, including a big five-on-three kill in the opening minutes of the game. The Senior Rustlers improve to 7-3 on the season, and stayed perfect at home with their fifth straight win at the Penhold Multiplex. 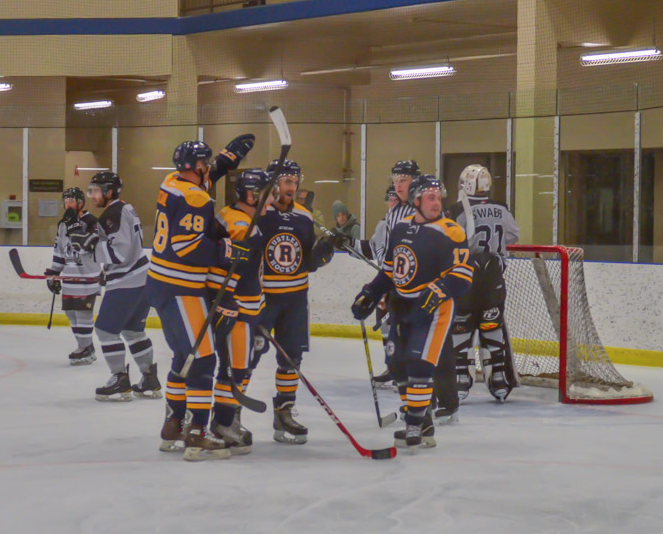 The Rustlers are back home for the last time in 2018 on Saturday, December 15 for another important match-up against the Eckville Eagles, who also sit near the top of the NCHL standings. Game time is 7:30pm. The 2018 portion of the season closes out in Sylvan Lake on Friday, December 21 against the Pirates.